Immersive gameplay with different flight control approaches and low motion sickness tolerance. Welcome to the Duck Force, recruit! Experience an amazing adventure in the rough stone age, where the bunny people under rule of a maniacal leader strives for the absolute power. 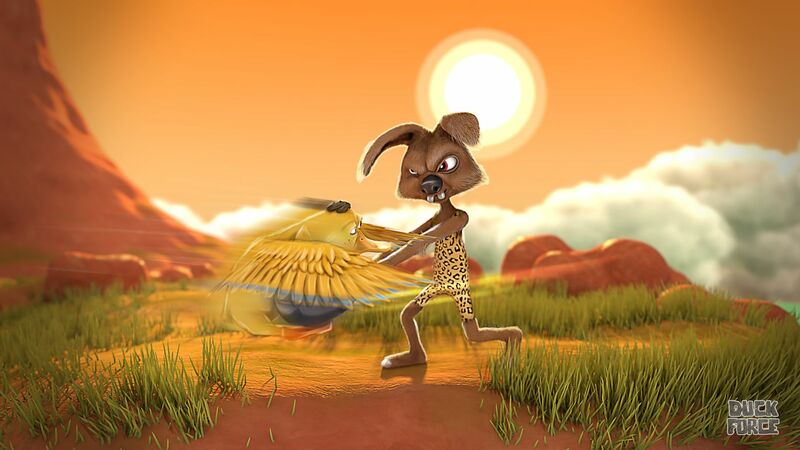 Prove your skills in an epic air battle and show the crazy bunnies where a drake has his feathers! In varied levels, you must be stronger, faster and more skilled than your insidious opponents. Fly through dry deserts and rocky canyons full of challenges and evolve from a lame duck to a majestic flight artists. At the end of each climate zone a powerful boss is waiting for you. Will you be victorious at the end? By the Duck Force, we count on you! Great game. One of my favorites in VR. Very clever and immersive gameplay. This game doesn’t give me motion sickness. Unique game where you play/controll a flying duck while standing in the level or following the duck. Nothing else has come as close to that feeling of flight that this game captures. You should AT LEAST try the demo. It’s free ffs. If you don’t like it, accept that you hate ducks, life and yourself and go play some lame dating sim.